Moving house is one of those life necessities. Its not always simple and it requires a fair bit of planning, but its a wonderful opportunity to refresh your style and make yourself a new home. One of the pleasure of moving house it making the most of the ‘‘out with the old, in with the new’’ rule by clearing out the clutter and setting up a nice, new organised system from day one. Avoid taking everything, including the kitchen sink. There is nothing worse than keeping the dusty and unused items that you’ve clung onto just in case. If you haven’t used it within the last year, chances are you won’t. Be firm and don’t let yourself pack it away for a rainy day that might never come. Allow yourself to refresh you home. You might want to buy new furniture for your new home. You know in your heart what items are really treasured possessions and what is being kept around out of convenience. Ditch the sinking sofas by giving it away on sites such as freecycle and gumtree, letting them take it away for you. Find a local charity shop and donate anything thats useable but an extra. Old clothes, plant pots and your third frying pan are things that you may like but don’t really need. A charity shop would certainly appreciate the donation. Once you’ve loaded your precious and personal possessions into the moving van, you can start getting your old place cleared out. Make sure you leave as clean a house as you expect to arrive in. Hire a professional cleaning company to clear out the junk, debris and unexpected amounts of miscellaneous items you’ll have amassed over the years. This will take one of the biggest jobs off your hands. Clearance Solutions, house clearance specialists, advise that ‘a good clearing company will also be able to sell on any items of value that you no longer want to keep, which will help cut down the cost of moving’. A little elbow grease can go a long way. A day of soap, sponges and hot water will easily clear away any grime or dust left behind. If you really don’t fancy getting down on your hands and knees; or don’t have the time, there are plenty of reputable cleaners who will specialise in moving out cleans. If you are renting, check with your Landlord or Agent as they may have list of reputable and trustworthy cleaning services. Once you move into your new place, the first task (before you can settle down with a nice mug of tea) is to unpack. London Estate Agents, iProperties say that ‘one of the key factors for buyers is having the storage options they need. Built in wardrobes and kitchen layouts designed for usability are particularly appealing.’Take each room into account as you unpack it. Look at the space and layout to figure out what you need and where. For example, in the kitchen, is there a plug for the kettle near a cupboard where you can store your mugs, coffee and biscuits? 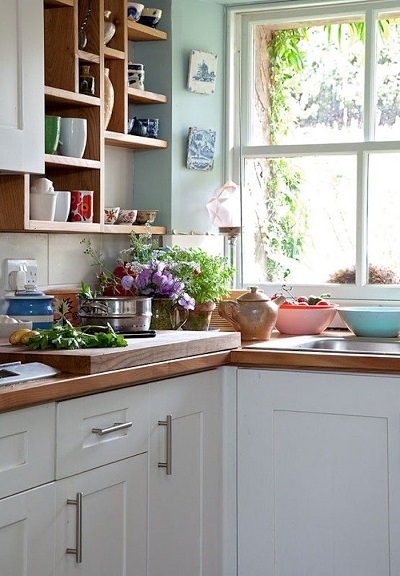 Picking and choosing the best place for your cutlery, brooms and tea cloths will make tidying up quicker and easier as you’ll have built in a logical system. Have tea towels near the sink and utensils near the stove. There are plenty of additions you can make once you’re set up too, such a putting up a calendar and getting special containers or crafting unique storage ideas. Some movers will also be happy to unpack for you. If you choose this wonderful, luxury service, make sure to label the boxes correctly with each room to avoid extra fuss. You’ll still need to organise the unpacking but it’ll take less time. For a cheaper option, get family and friends to chip in and reward them with treats once the job is done. Getting through the months of planning, plus days of packing and unpacking, might leave you a little exhausted. Take a couple a days or a long weekend just to relax. Afterwards, keep on top of the tidying up by doing a little every day. Routine will save you from whole days of exhausting spring, summer, autumn and winter cleaning. If you get into the habit of wiping down all the surfaces, putting the cushions back into place and giving everything a light dusting every week, then chores soon won’t feel like chores at all. If you’ve got a big family, or are living with a few people, why not make a little rota of duties. Take the complexity and complaining out of the cleaning tasks by giving everyone a job each. You’ll be the envy of your friends and happy to wake up in your beautiful home each morning. “Organize as you unpack” is the best idea for making things well settled when we move to the new house.Nice ideas for cleaning out and setting up the things in the new house. Thanks for posting,keep it up! This is sound advice. I agree with “hiring a reliable clearance specialists” point about the individual circumstances. Having a trustworthy clearing company is important ingredient. If you use someone unreliable or incompetent it will cost even more to fix everything they mess up.